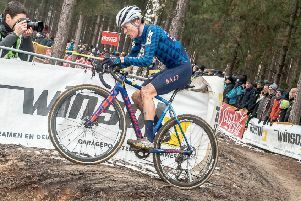 Yorkshire teenager Tom Pidcock raced to victory in the World Cyclo-Cross Championships on Saturday, securing the under-23 title in Bogense, Denmark. The rider from Leeds, who hopes to step up to Elite next year, clocked a time of 47.42 to clinch the top step on the podium and continue his fine form in 2019 having won the elite national title just three weeks prior. “I was feeling really good,” said Pidcock. “I had a mechanical with my gears early on, but it turned out all right. Pidcock waited until the fourth lap to strike and take the lead when eventual silver medallist Eli Iserbyt let up on the pace, and 19-year-old Pidcock sprinted by. The Yorkshireman adds the Under-23 title to the Junior World Championships crown he won during the 2016-2017 season. He was also victorious at the European Under-23 Championships earlier this season and can now add another rainbow jersey to his collection. Fellow Yorkshire rider Ben Turner also performed well in the under-23 category, finishing sixth. The 19-year-old from Doncaster crossed the line in 48.20, 38 seconds down on Pidcock. Earlier in the day there had been British success in the junior race with Kent-based Ben Tulett became only the second man in history to win successive junior titles. The 17-year-old finished 20 seconds ahead of Belgian favourite Witse Meeussen. n Cycling’s world governing body the UCI is expanding its use of video referees this season to 20 leading races. Following a series of controversial incidents, most notably Peter Sagan’s disqualification at the 2017 Tour de France for a crash involving Britain’s Mark Cavendish, the UCI added a video referee to its race juries at the three Grand Tours, five biggest one-day races and Road World Championships in 2018. At a meeting of its management committee in Denmark this week, the UCI has now decided to use video replays at 11 more leading one-day races, including the Amstel Gold Race and Strade Bianche. The UCI also announced it carried out 15,756 ‘technology fraud’ checks on bikes with hand-held magnetic scanning tablets in 2018, and a further 647 checks with its mobile X-ray machine. No positive tests were recorded. But while rumours of hidden motors continue to dog the sport, the UCI confirmed that it is continuing to work with France’s Alternative Energies and Atomic Energy Commission on developing more sophisticated magnetic trackers to catch any rider tempted to use some mechanical assistance.